Since then, thousands of women have become thriving members of their community through work and partnerships. The residents at Thistle Farms are offered two years of free housing with no authority in the the homes – meaning the women are not supervised but live with independence. They are provided with medical care, therapy, education and job training without charge or government funding. “Our hope is for the entire community to give to one another in gratitude for all the mercy and healing we have known,” she says. The women work to gain financial independence through the social enterprises of Thistle Farms. 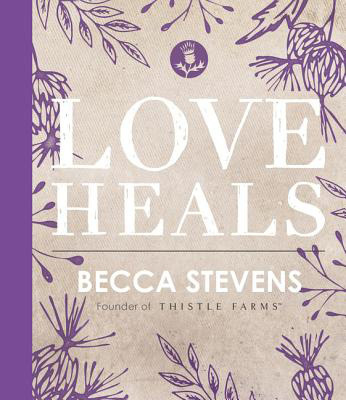 They produce candles and body-care products and operate a café and artisan studio under the motto, Love Heals. “We realized that the women we were serving were dirt poor, so we created this bath and body care company so women could have jobs, earn wages and make choices in their lives,” says Becca. “It made perfect sense to me to make body care products that were about healing bodies that had been abused for so long.” Her hope is that when their products are purchased that others are reminded that they are helping a community of women re-establish their lives. One such survivor from Thistle Farms is Dorris Walker. She suffered childhood trauma at a young age that eventually led to her drug and alcohol addiction, prostitution and abuse. “My father and mother were humble believers in God and I have always carried that belief inside of me, even throughout the devastating years of my addiction,” she says. For more than 20 years, Dorris endured the violence and trauma of the Nashville streets. Thistle Farms has given her a chance to heal. “I have managed to put my life back together again with the blessings of the Lord and the dedicated love of Magdalene and Thistle Farm,” she says. “I am dedicated in paying the love forward and speaking out for the women around the world who have yet to find their way home.” Today, Dorris is the Events Coordinator and on the travel team for Thistle Farms. She is an accomplished speaker and advocate, has been interviewed multiple times, most recently by Jenna Bush Hager for The Today Show. Today Thistle Farms is the largest social enterprise in the US led by survivors of prostitution and addiction with over $2M in sales revenue and a national network of 50 sister communities. More than 25,000 volunteers have served at Thistle Farms and Magdalene. Thistle Farms has 19 international partners to employ women survivors. Last year alone, they: shipped more than 4,900 packages to 3,800 customers in all 50 states; served more than 3,000 customers at the shop at Thistle Farms and nearly 7,000 people in the Thistle Stop Café; employed 41 survivors across all departments; housed 61 in the Magdalene program; provided 1,873 medical and mental health appointments to survivors; funded 208 women’s salaries around the world through global partnerships; and launched the Welcome Project (employing 10 Syrian refugee women who have manufactured more than 900 mats). In spring 2016, Becca watched a grim video about the refugee crisis in Greece and decided to do something about it. In April of last year, Becca arrived at a barren refugee camp on the Greek island of Evia armed with two looms and a unique idea: to teach the women there how to weave welcome mats from discarded life jackets worn during the treacherous sea crossing from Syria.